A ball that has a mass of 2kg is launched upward at a velocity of . What is the initial kinetic energy of the ball? Assume the ball is traveling in a vacuum. We are given both the mass of the projectile (2kg) and its velocity ( ). Using these values, we can solve the equation. Which of the following measures depicts the amplitude? 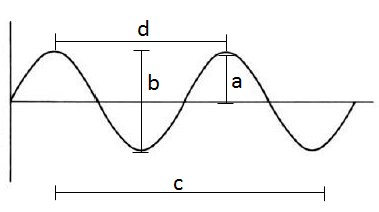 The amplitude measures the greatest displacement (either positive or negative) of a wave from the x-axis. Visually, the amplitude appears to be the distance from the x-axis (center line) to the top of one peak. In the figure, this value is given by A. 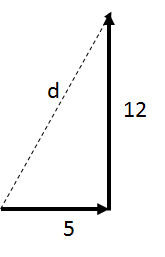 The other relevant measure given in the figure is segment D, which measures the distance between two peaks. This distance is known as the wavelength. Segments B and C do not provide useful measurements of the wave function.